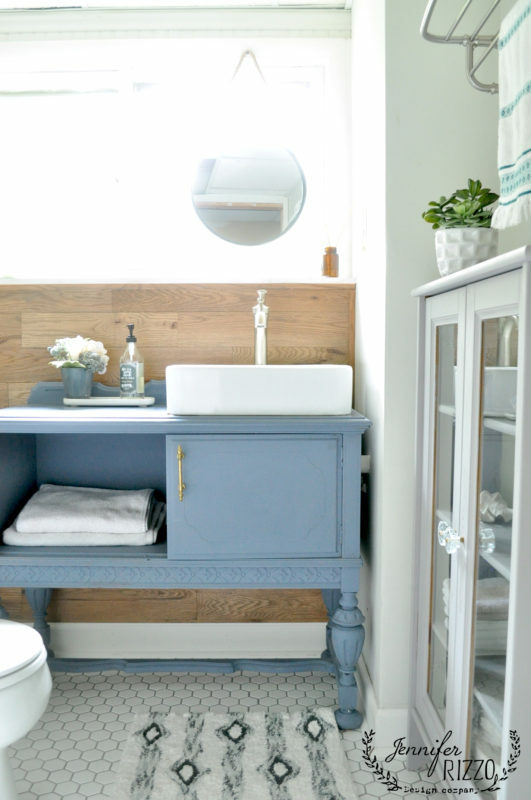 Tiny bathrooms can be challenging in both function and design, but there are some clever workarounds for this petite space! Let’s explore 10 helpful tips for making the most of your small bathroom. 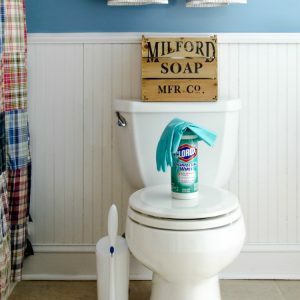 Thanks to American Standard for partnering with me on this post and for creating a toilet that cleans itself! All words and opinions are always my own. 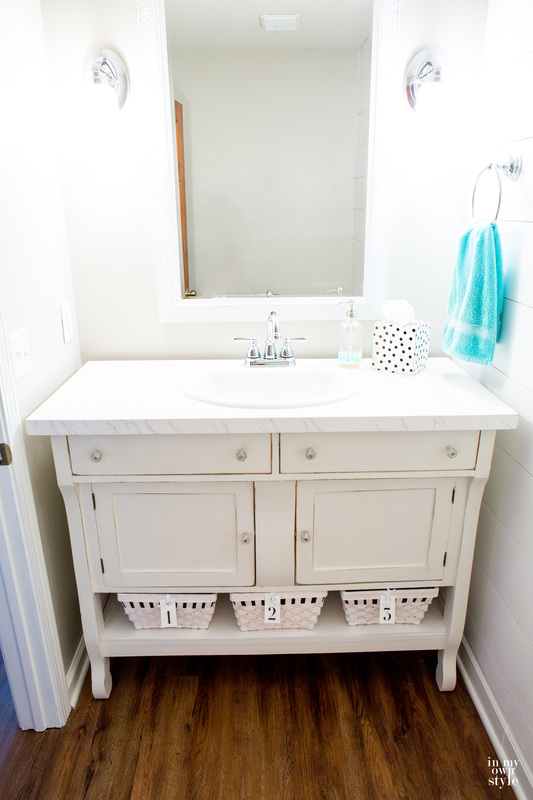 Tip 1: Repurpose an old dresser into a bathroom vanity. Save money and add character to your small space by building your own custom vanity. You can repurpose an old dresser, or build a vanity from scratch to create a functional sink and storage area. There are several do-it-yourself tutorials available online showing you how it’s done. 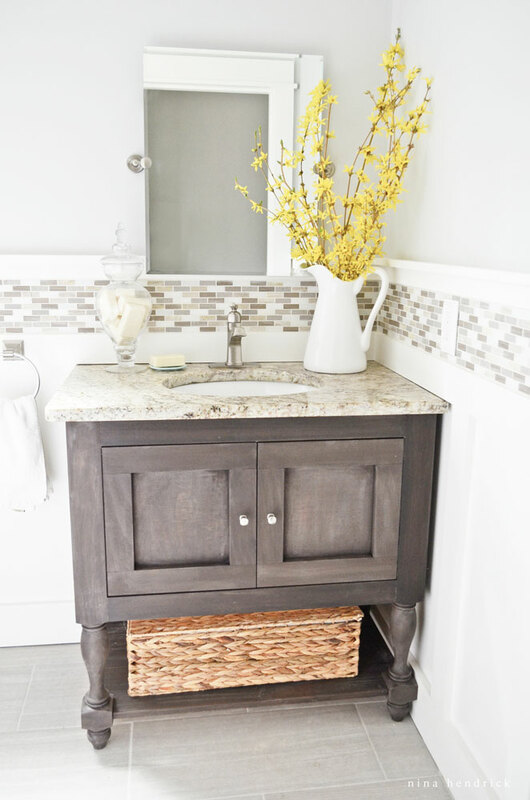 A dresser vanity offers more storage space than a pedestal sink and gives your small bath a custom look. Source: Jennifer Rizzo turned an old cabinet into a gorgeous vanity. 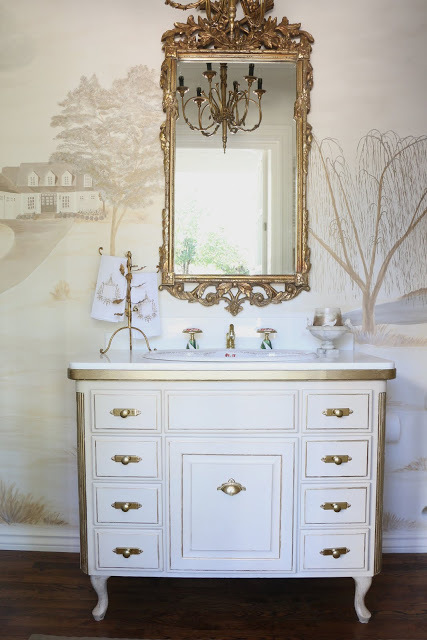 Source: Nina Hendrick built this beauty for her powder room. Source: In My Own Style repurposed a treasured sideboard in her powder room. 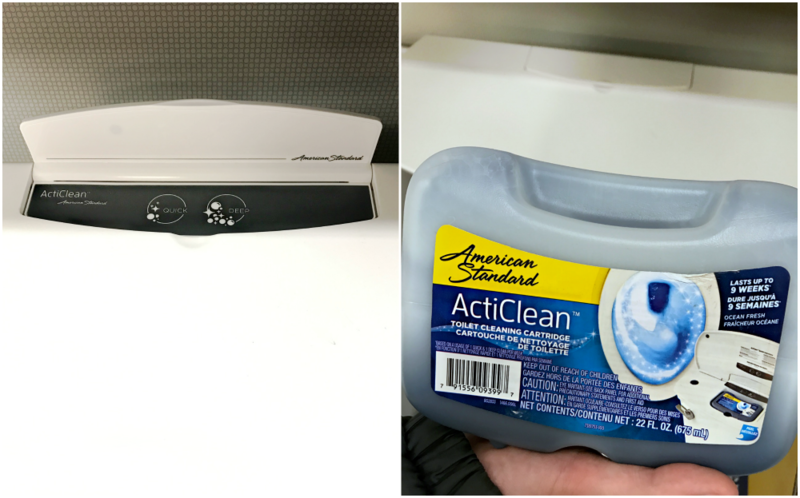 Tip 2: Eliminate the frustration of cleaning a cramped toilet by installing the self-cleaning American Standard ActiClean Toilet. A toilet that cleans itself? Yes please! Small baths are often the most frequently used bathroom in the home and can be difficult to keep clean. The American Standard ActiClean Toilet cleans itself with a fully integrated self-cleaning system and VorMax flushing technology. You simply press a button–quick or deep clean–and let the toilet do the rest! It is literally that simple. The Quick Clean cycle takes one minute to complete while the Deep Clean provides an extended, 10-minute cleaning. The cleaning cartridges last up to 9 weeks and are easy to install. Click the link for more details and to learn more about how the technology works. You can buy the American Standard ActiClean Toilet at Lowe’s and other exclusive showrooms. 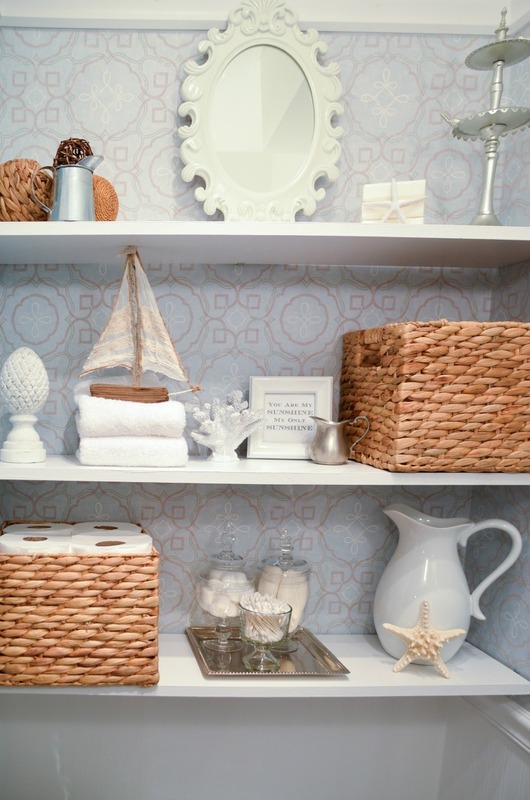 Tip 3: Maximize storage in a small bathroom with open shelving. 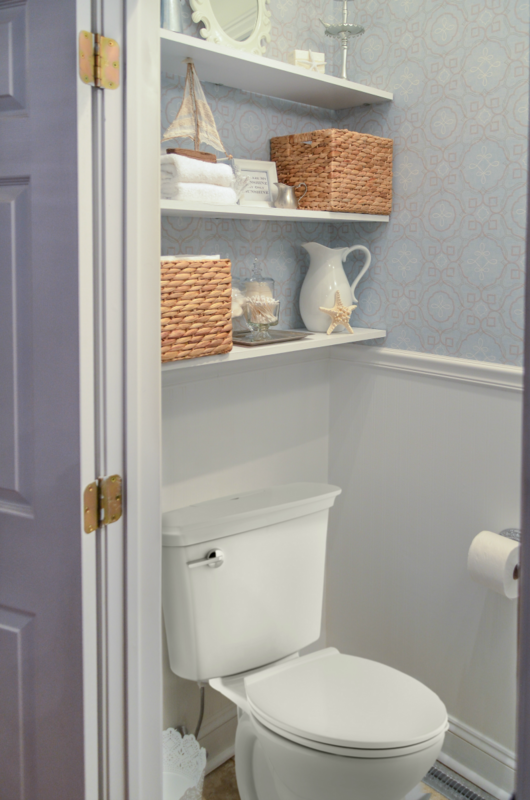 Installing open shelving above the toilet in a small bath adds storage and beauty. 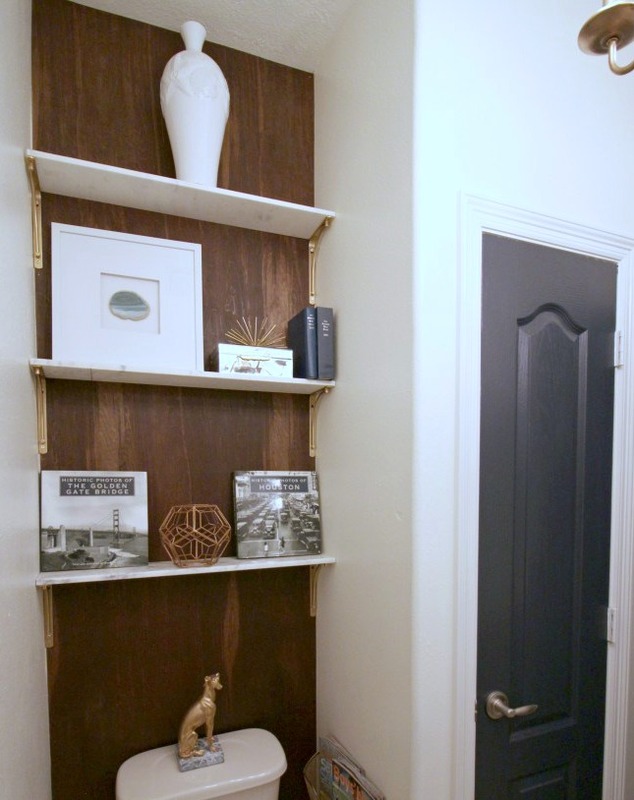 Shelves are easy to install and create a big impact with minimal effort. Source: Home Stories A to Z‘s semi-floating shelves above the toilet. 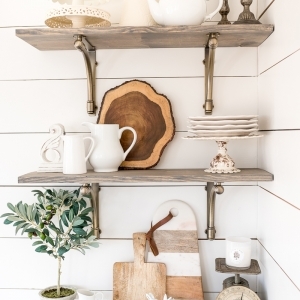 Source: The Aspiring Home chic shelves in her recent bathroom makeover. 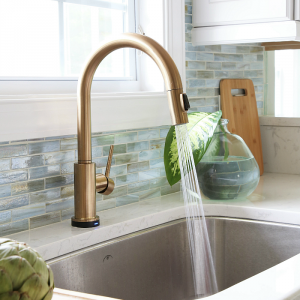 Tip 4: Use peel and stick glass tile for a quick, no-fuss update. You’ve probably heard of peel and stick floor tile, but did you know that you can find peel and stick tile for your wall? If you rent your space and desire an upgrade, this is a great option. Visit PMQ for Two to find out how she installed the tile without damaging the walls. Source: PMQ for Two renter-friendly peel and stick subway tile application. Tip 5: Sneak in a small shower. You only need 30 x 30 inches to install a small shower in your bathroom. 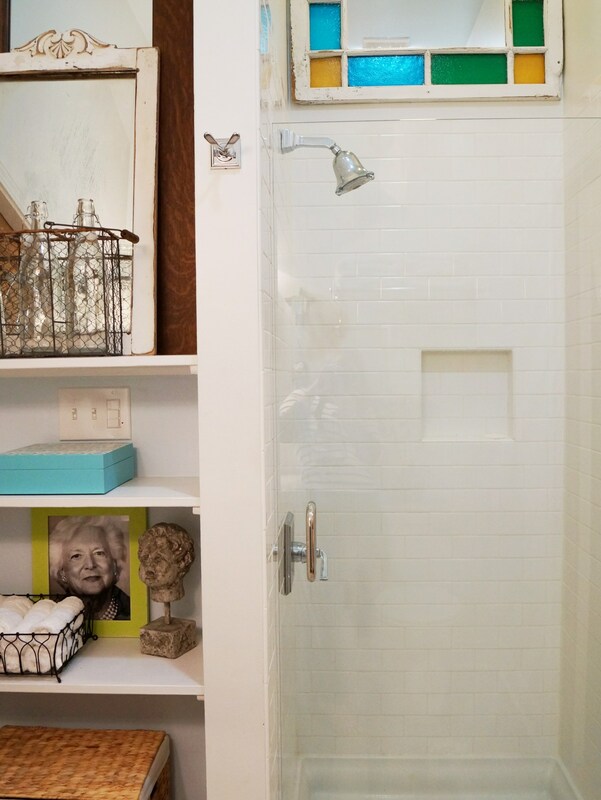 Corner showers and closet-sized showers do the trick and can still look beautiful! Use a glass door to give an upscale look and show off your tile. Source: Maggie Overby Studios installed a bathroom where there was none! 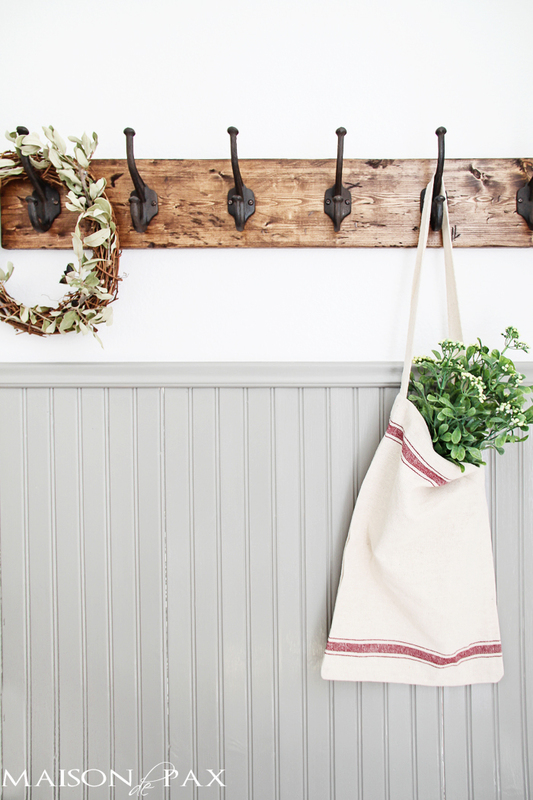 Tip 6: Consider installing hooks instead of towel bars to create more space for towels and cute decor. 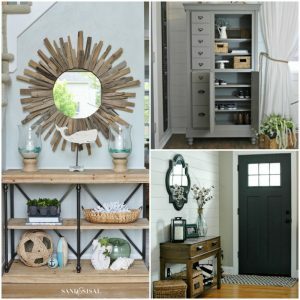 Coat rack hooks aren’t just for the mudroom! 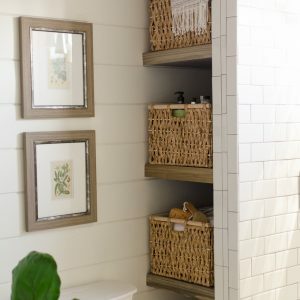 Installing wall-mounted hooks in a small bath provides more room for towel storage and gives a rustic, casual vibe to the space. Source: Maison de Pax small half bath makeover in a rustic motif. 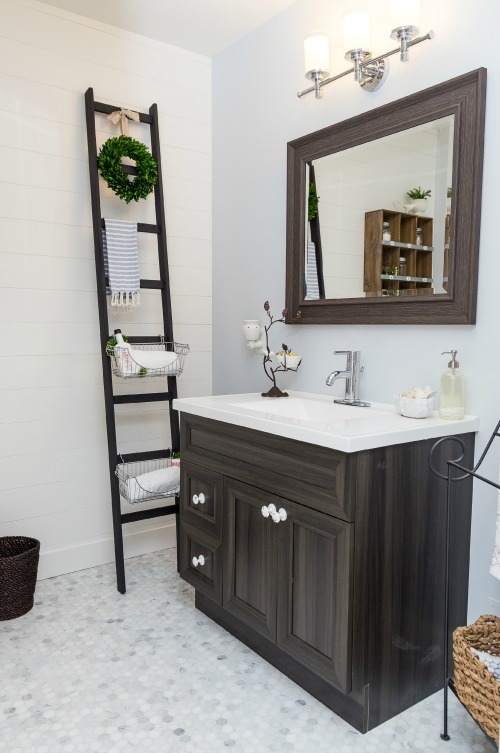 Tip 7: Use a ladder in a small bath to add an unexpected design element and vertical storage. 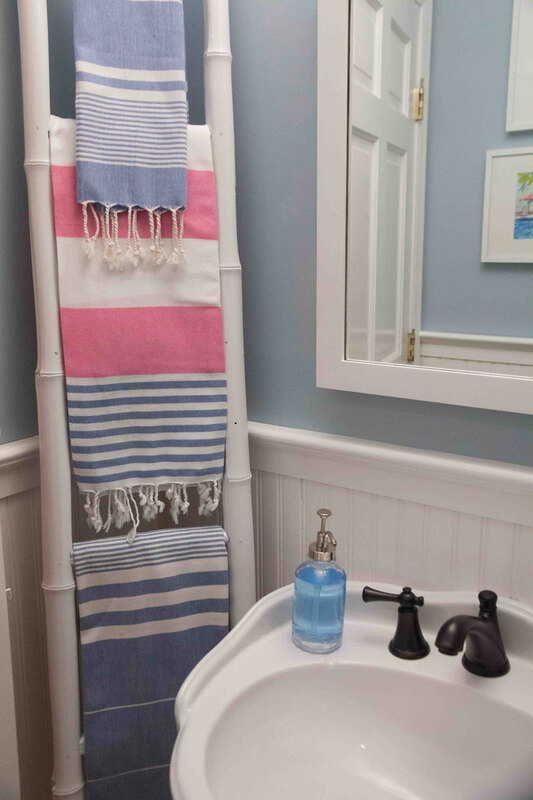 Placing a decorative ladder in your small bath provides a fun way to store hand towels and other bathroom sundries. Hook-on wire storage baskets can be added to the ladder rungs to create additional storage. Source: Clean and Scentsible bathroom remodel with decorative storage ladder. 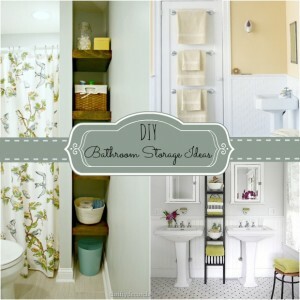 Source: All Things Big and Small One Room Challenge bathroom makeover. Tip 8: Update your vanity with paint and new hardware. 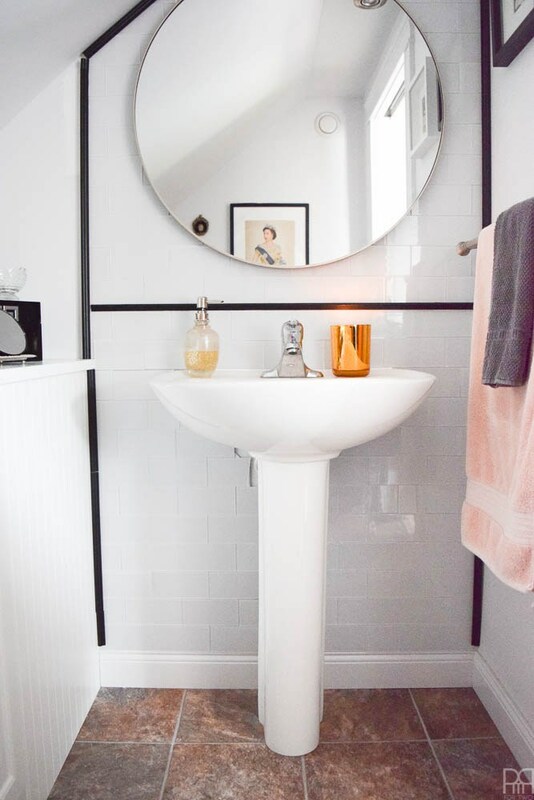 A vintage or builder-grade vanity can make a small bathroom feel dated. Try updating your hardware and painting your vanity to freshen up the space. Source: Eleven Gables powder room makeover with painted vintage vanity and hand-painted wall mural. 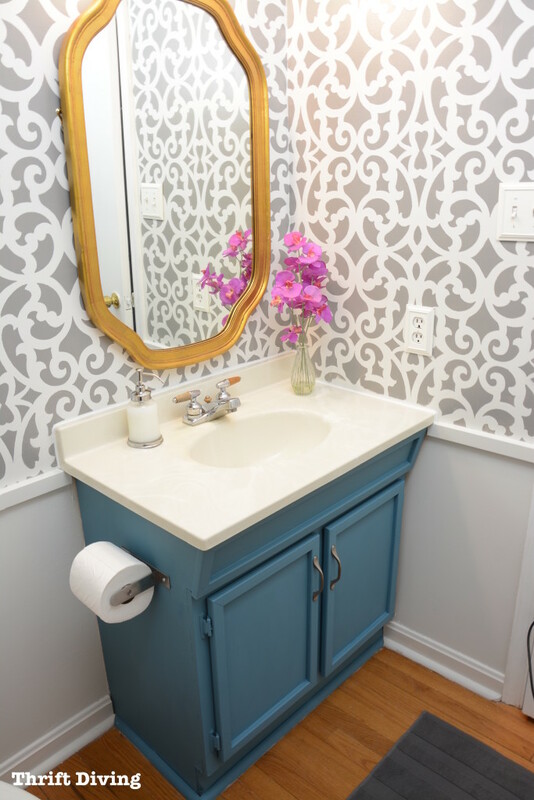 Source: Thrift Diving budget bathroom makeover with painted vanity and stenciled wall. Tip 9: Install a pocket door and transom window to save space and brighten a small bath. Rolling doors, or pocket doors are a brilliant idea for a small bath. Pocket doors expand usable square footage in your bathroom by freeing up precious wall space. To brighten a small bath and amplify architectural interest, consider adding a transom window above your bathroom door. 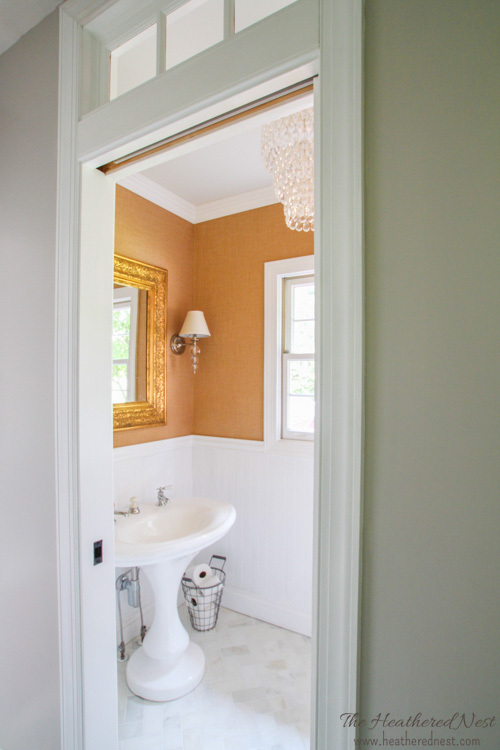 Source: The Heathered Nest bathroom makeover with pocket door and transom window. Tip 10: Make a bold statement and express your decor style in your small bath! A small bathroom is a great place to experiment with decorating. The space is often closed off from the rest of the home allowing you to break continuity in your decor if you so desire! Wall treatments such as stencils, wallpaper, custom trim, tile, and shiplap are great options for small baths. Expensive wallpapers and designer tile become affordable and obtainable in small spaces. 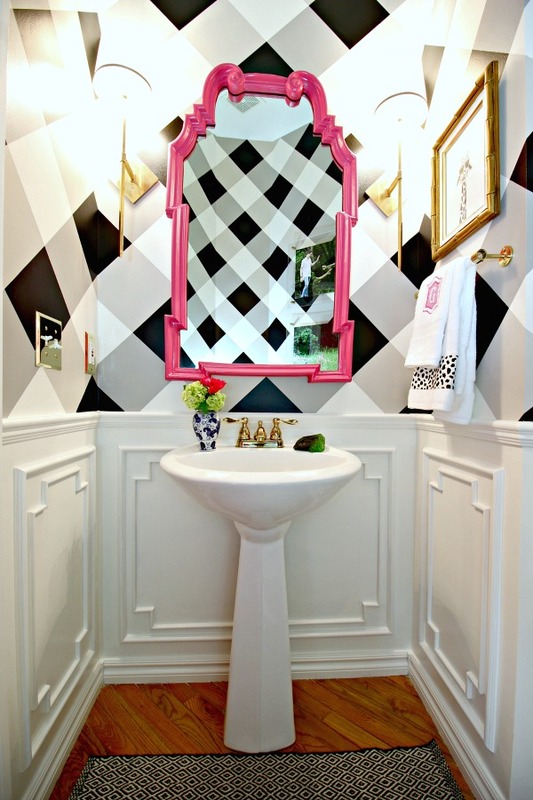 Source: Dimples and Tangles black and white buffalo check powder room makeover. 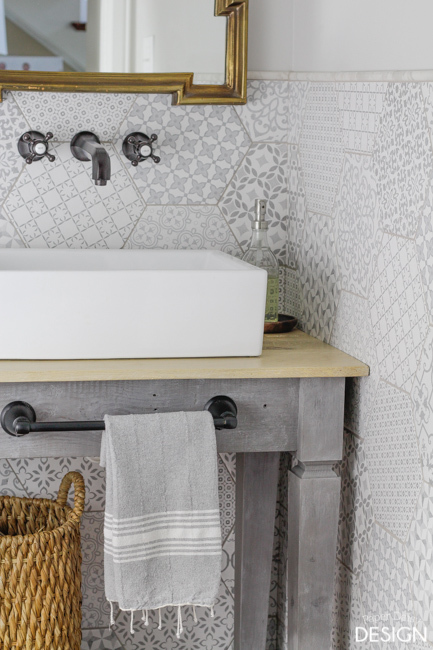 Source: Paper Daisy Design hexagon tile wall bathroom makeover. Wonderful tips! Thank you so much for sharing. I’m going to go try some of these tips out… hopefully my 4 year old will cooperate for mommy! Thanks so much for your sweet comment Sharon!